South Africa’s population of leisure boats has one of the world’s highest percentages of rigid inflatables; the South Africans appreciate their special properties, and the builders compete hard to produce class products. The fibreglass hulls of the Gemini range of rigid inflatables (RIBs) come from South Africa, and everything else is produced locally: an arrangement that suits the boats for local conditions and allows for a lot of custom work. 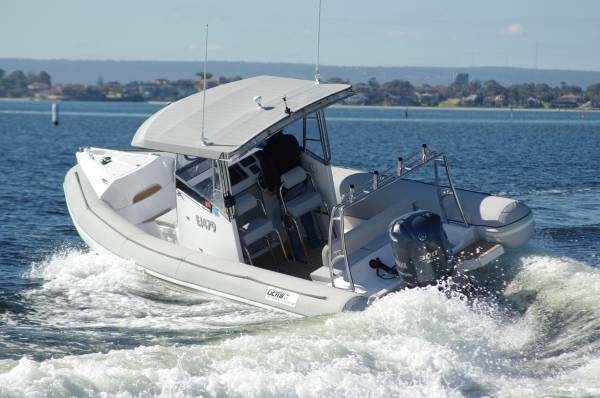 The review Gemini Elite 675 is a new centre console model with a high end fit-out. This is not the kind of console that keeps the driver cool and only slightly wet, and everyone else mutinous. 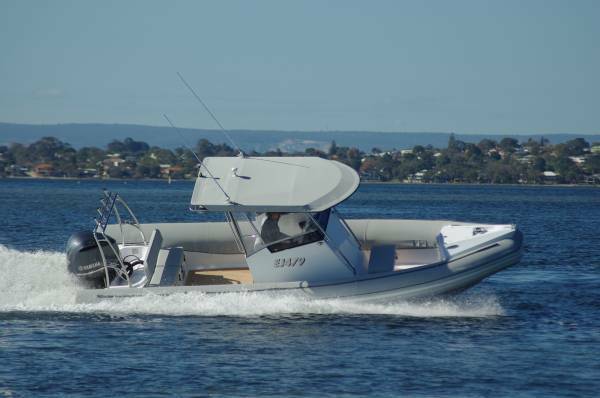 It is wide, with sides extending well aft, and is equipped with clears and an unusually large Bimini. This is mounted on a frame beautifully executed in stainless steel, extends well forward of the windscreen, and contains within it storage for half a dozen life jackets. The two seats at the console are reversible and well positioned for fishing. They are the only pure seats on board. The double ahead of the console and the 2-3 seater at the transom are mounted on three removable ice boxes – big ones that could be pressed into service for other storage, but that also give party boat credentials. The console houses more storage, almost cargo carrying quantities of it. The rear bulkhead has a press-stud fabric door, so much more convenient than a solid version. The buoyant tubes are made of Hypalon, sub-divided into five separate chambers. Consumer fears over short tube life on RIBs stem from cheap imports fitted with PVC tubes, material with a high susceptibility to UV degradation compared with Hypalon’s near immunity. The tubes have added protection, from wear rather than from the sun: as well as rubbing strakes the tubes have a removable cover over their top surfaces to take the wear of feet boarding the boat. In what is at least a partial role in the likely future of this boat, a good many feet will come over the tubes. 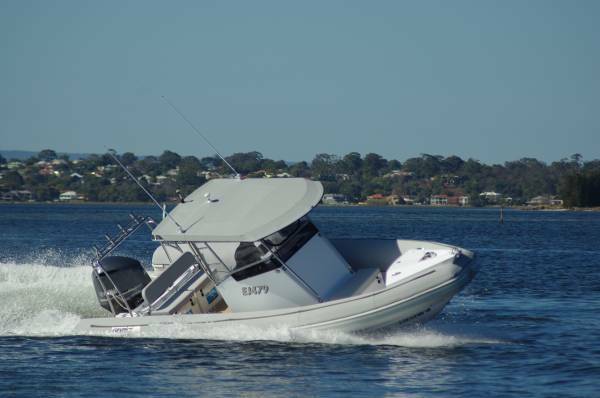 The Gemini is a big load carrier and, as well as being a first class sport fishing tender, will be in demand for ferrying hordes of passengers out to the big boat on its mooring. The tubes will handle all those who miss out on an official seat. The deck’s cork sheathing is kind to bare feet, and it extends over the twin rear platforms and up the moulded steps to the bow with its power windlass. The windlass is just part of a de luxe fit-out. Other items include a gantry above the motor carrying rocket launchers, an electronics suite that includes auto pilot and Clarion stereo, a fresh water shower, dual batteries, and pop up cleats. 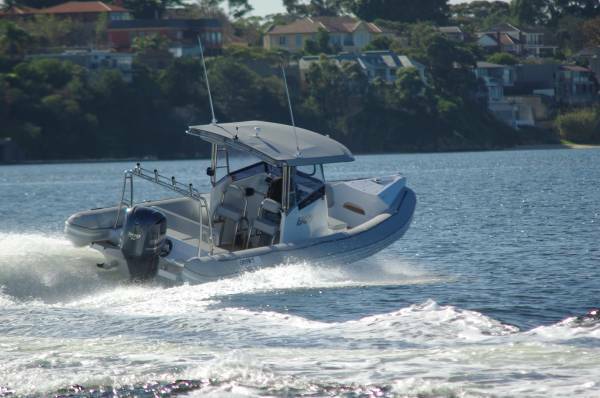 The engine fitted to the review boat was a 300hp Yamaha four-stroke, a popular choice for this size and style of boat. With the biggest V-6 block in the business, low weight and a bagful of technological goodies, it produces blistering acceleration. Top speed is almost academic, but is only a little short of 50 knots. 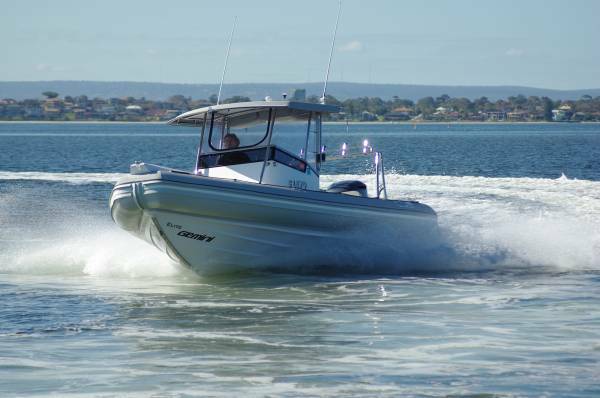 Being a RIB, the Gemini can use a bigger share of the knots on more occasions than a conventional boat. The narrow solid part of the hull, the acute deadrise, the sharp bow and the shock-absorbing tubes add up to a boat that can handle the rough stuff. We did not have any available and had to rely on a manufactured version – the wakes of other boats. We found boats pushing a lot of water and making realistically nasty waves; we attacked them at all angles with a relentlessly open throttle. The Gemini behaved immaculately: it softened the bumps and, at whatever angle we overtook a wake, it gave no suspicion of a broach starting. RIBs should be fun boats as well as great sea boats, and the Gemini fits the bill here too. Playing with wheel and throttle is a joy, and the boat is well set up for strenuous manoeuvres. Grab rails are in the right places for passengers standing or on the icebox seats, and those in the best seats get good bracing from the console’s structure for those tight turns.